This is the first recipe I’ve attempted from Martha Holmberg’s cookbook Modern Sauces (Chronicle Books, 2012). Risotto with tomato sauce sounds like an odd thing, but when you use the proportions and serving sizes indicated, the result is quite tasty and not nearly as calorific as you might think. It’s also a lot of work, but the way the recipes in this cookbook build upon one another, it would be easy to spread the work out over three or four nights. As it was, I had to do it all in one day, and it took about four hours of work. 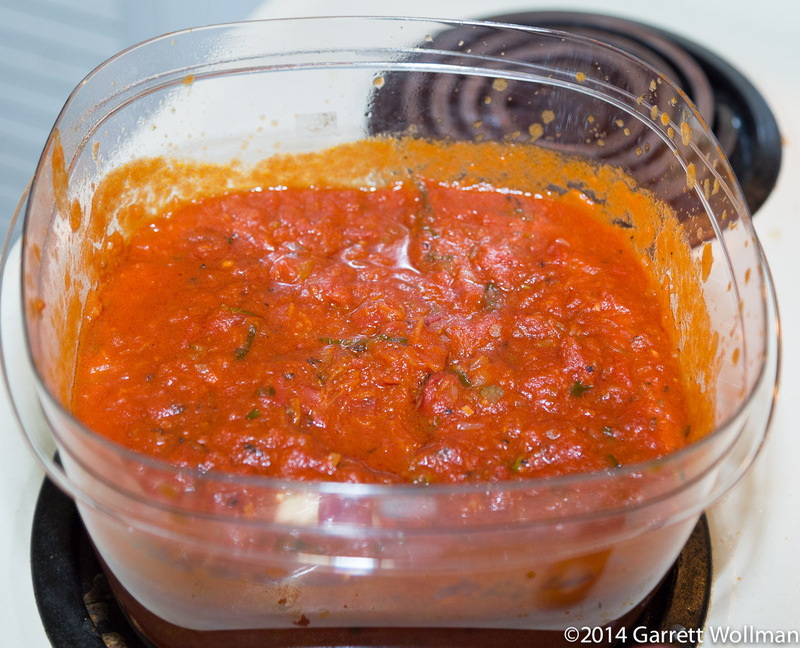 The process starts with making a simple marinara sauce — and could end there, if that was what you wanted. 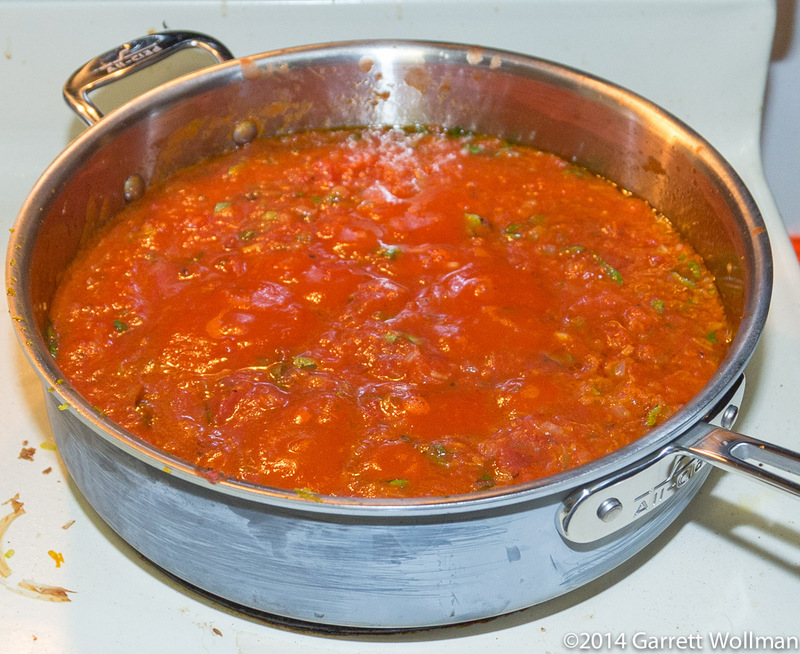 Once the marinara is finished, the next step is to turn it into a meat sauce (the “Very Meaty Tomato Sauce” of the title), and again, the process could stop there; indeed, for most of the meat sauce, it does stop there, because the meat-sauce recipe makes eight cups of sauce, but only two cups are required to accompany the risotto — which is part of Holmberg’s point in the book, that these sauces are versatile and can all be used for more than one purpose. I probably won’t have much else to do with the meat sauce this week (I should get four meals out of the risotto), but I can freeze it and bring it out another time for a simple spaghetti dinner. 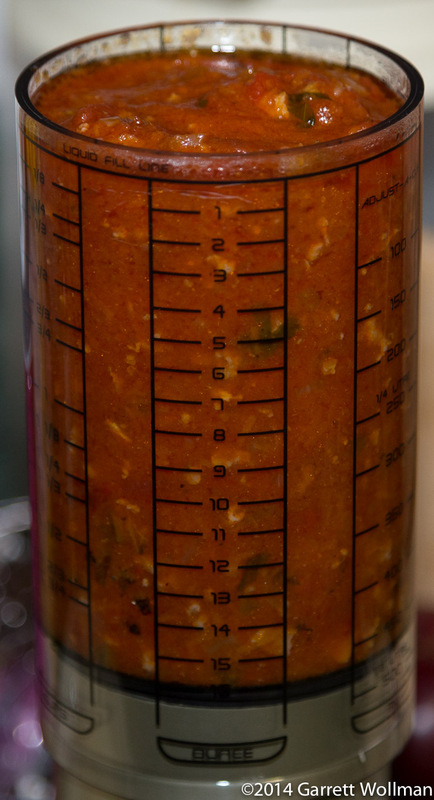 Similarly, the basic marinara is used as a base for several other of Holmberg’s tomato sauces, and it can also be used directly on pasta or pizza, so there’s no waste. 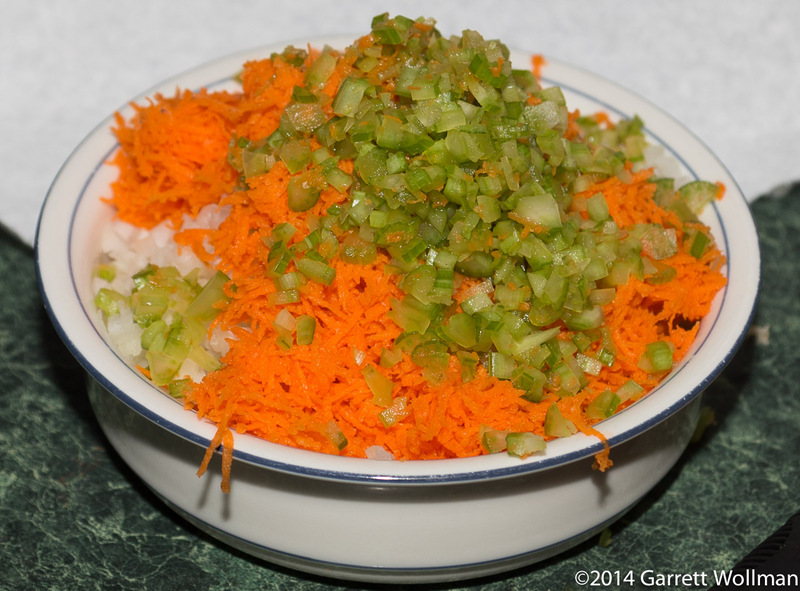 The marinara sauce starts with a fairly standard mirepoix. I don’t think it’s called mirepoix in Italian. The recipe said I could grate the carrots, so I did, but I used the wrong grater (should have been the coarse holes) — not that I think it made a difference. 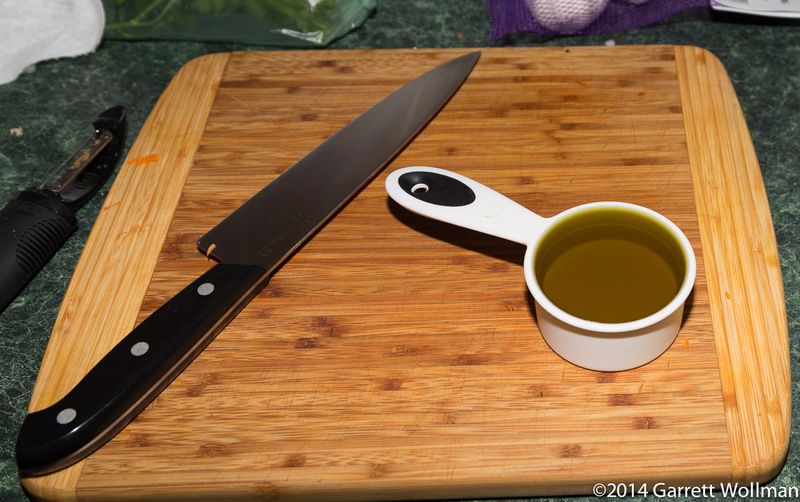 Half a cup of extra virgin olive oil looks like rather a lot when you measure it out. It’s a lot darker, too, when it’s not in a glass bottle. 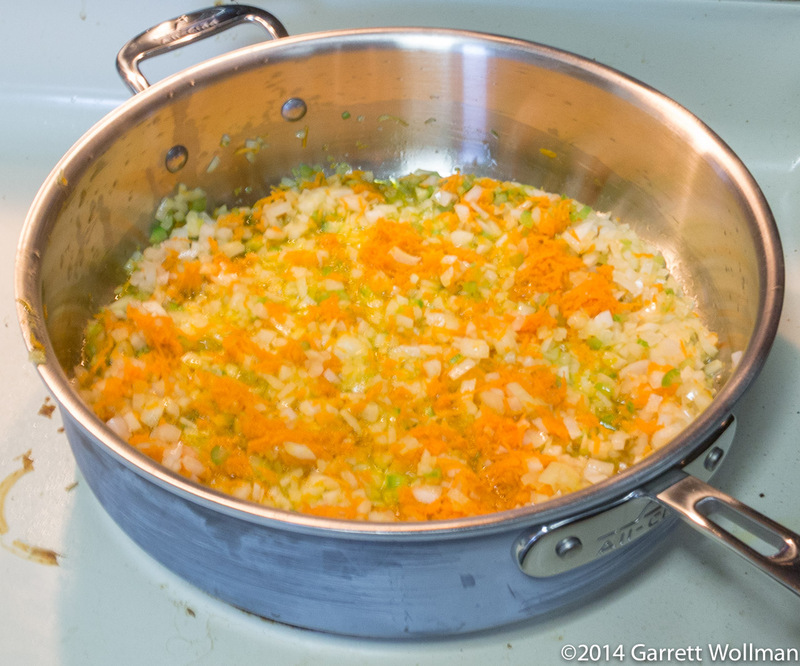 The mirepoix is now in the pan with the olive oil, sweating away. After sweating the mirepoix, canned crushed tomatoes (I used Muir Glen’s “fire roasted” style, because I like the flavor) and chopped basil complate the sauce. It has to reduce for about 20 minutes before it’s ready for the next step. Putting a splatter guard on the pan helps to keep my rangetop from becoming even more of a mess than it already is. The fine mesh screen allows water vapor to escape while keeping larger oil (and tomato!) droplets inside the pan. The recipe starts with mincing a quarter-pound of frozen pancetta in the food processor, after which it is cooked separately (along with more olive oil) to render its flavorful fat. 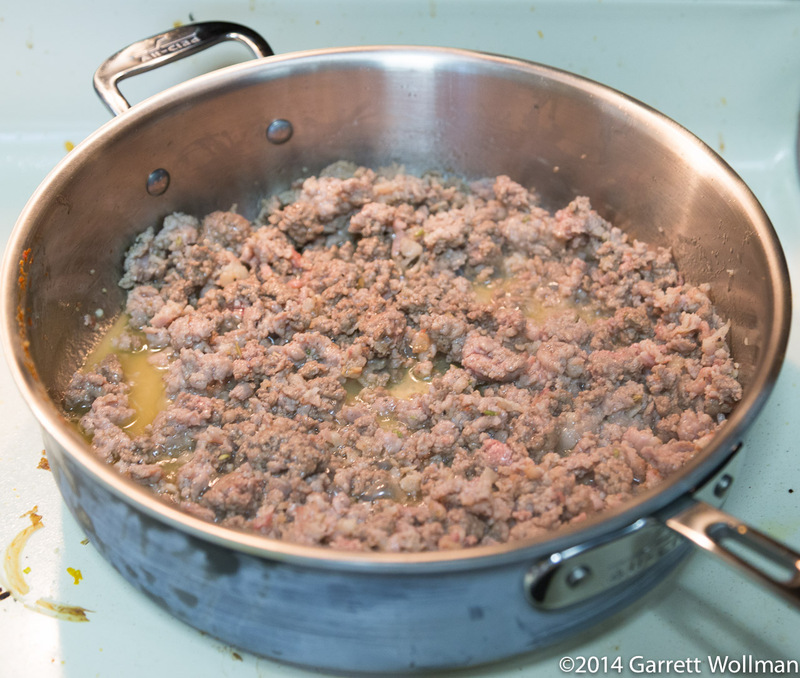 In addition to the pancetta, the recipe calls for half a pound of ground beef and half a pound of mild Italian sausage to be cooked and crumbled — all, like the pancetta, to be cooked without browning. I got the pancetta at Formaggio along with the sausage (I used their fresh fennel sausage, which is certainly close enough to “mild Italian” for my taste), since I was already going there to buy chocolate, but given the nature of this dish I did not consider it worth buying a (more expensive) artisanal pancetta — I just stuck with the national brand Fra’mani. 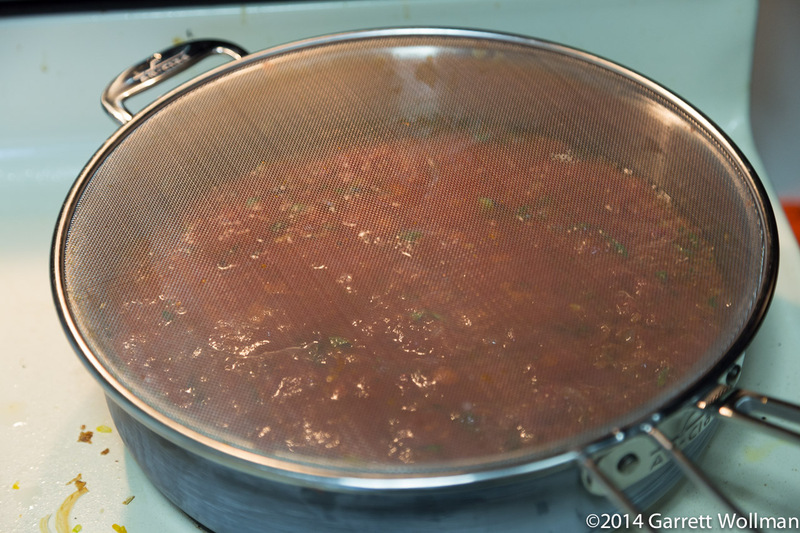 After cooking the meat, more herbs and the entire batch of marinara are added to the saucepan, along with some chicken broth, and cook for nearly an hour, with the last few minutes uncovered so the sauce can reduce to the desired consistency. 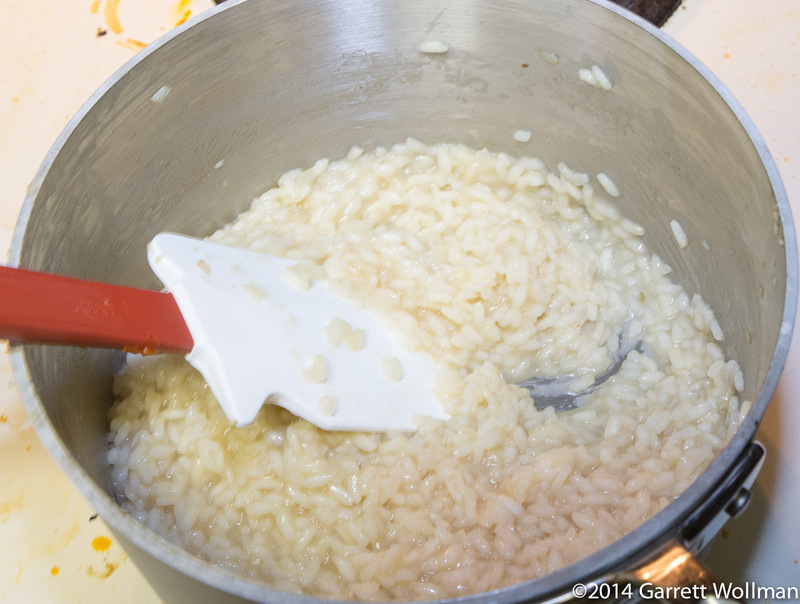 The process of making the actual risotto is fairly boring and in any case hard to photograph as one is supposed to stir pretty much constantly. 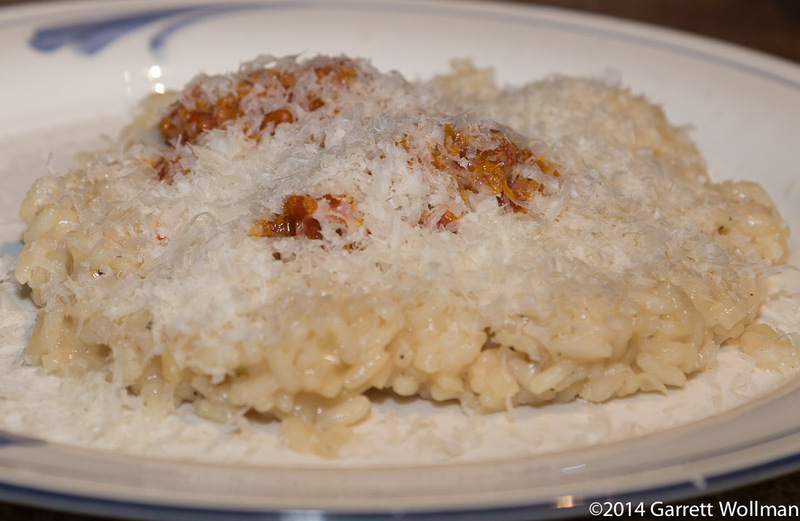 I used Carnaroli rice, because it was what I already had. Chopped onion is sweated in the pan with butter, then the rice is added and fried for a minute or so. The pan is deglazed with a half cup of white wine (thanks to the folks at the liquor store for stocking those tiny little single-serving bottles of wine, which make many recipes like this one accessible to non-drinkers), and then the laborious process of adding chicken stock, stirring, adding stock, stirring, and so on, begins. After twenty minutes of pouring and stirring, stirring and pouring, the risotto is finally done: creamy in texture but still slightly toothy when chewed. It’s thick enough to leave a clear spot behind in the pot when the spatula is dragged through. 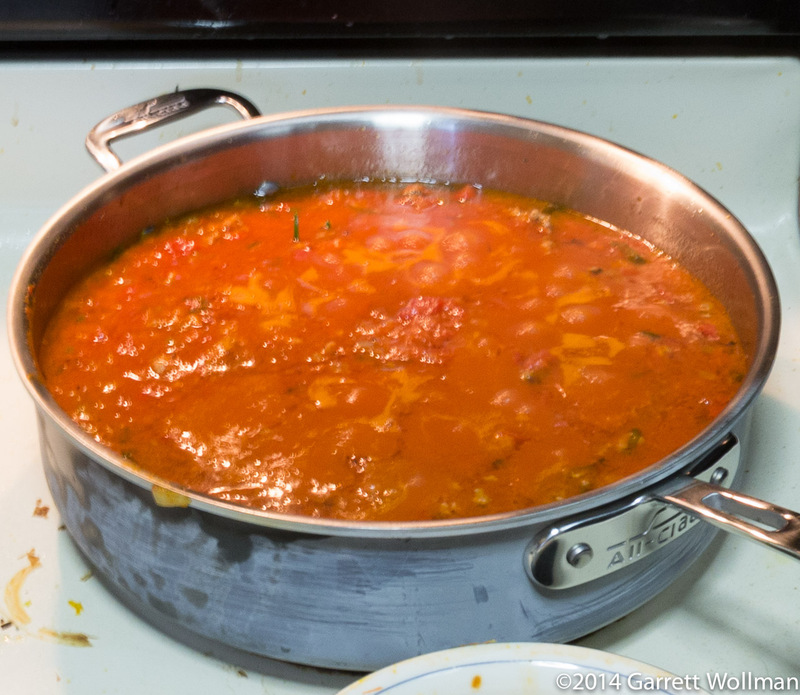 UPDATE 2014-07-30: I portioned out the rest of the meat sauce for freezing today and found that I had made 9 2/3 cups originally (about 19 servings); I’m assuming that it probably didn’t reduce quite enough during cooking. The numbers below have not been adjusted to reflect that. It’s really not as bad as you might expect, provided you stick to the suggested serving sizes. This is for the sauce alone, and unreduced. I suspect it would make a great accompaniment for cheese-and-veggie ravioli (and will report back once I have had a chance to try), although obviously one would want to have fewer ravioli with this sauce than one would with a regular (much lower-fat) pasta sauce. 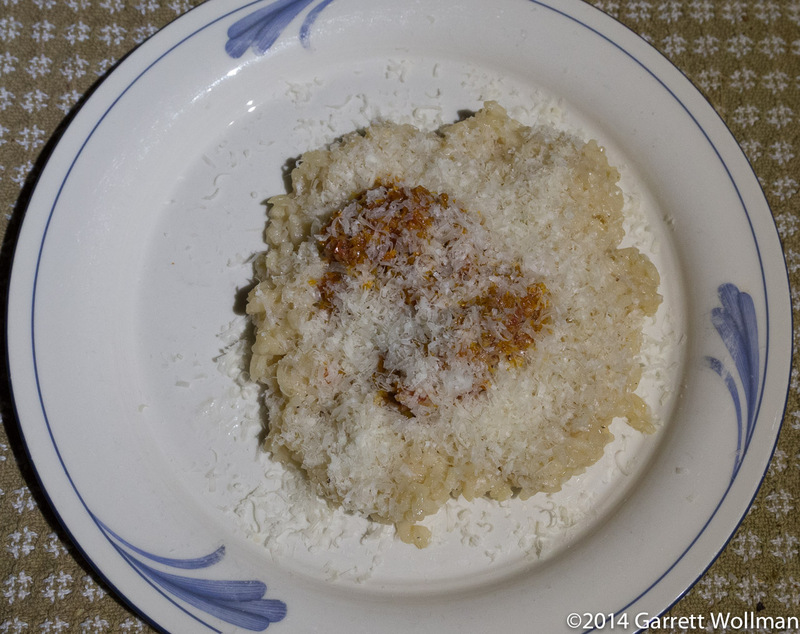 This entry was posted in Food and tagged marinara sauce, Martha Holmberg, meat, meat sauce, recipe, rice, risotto. Bookmark the permalink.